High blood pressure is a widely misunderstood condition. It essentially did not exist 100 years ago! My first comment regarding HBP is to do all I can to support the patient into lowering it!! Although I respect their existence, I do not like pharmaceutical medicines because they mask the symptoms as opposed to getting to the root cause(s). **Problem is that in 95% of the cases documented in the U.S., the underlying cause cannot be determined. This type of high blood pressure is called essential hypertension. On the other end of the stick, I am also not fond of using natural supplements for any length of time but may indeed recommend them for a short period to support my patients as they make the necessary lifestyle changes to permanently reverse this condition on their own accord..
Every person’s high blood pressure is unique to that individual. Blood pressure is almost a “private thing” with us knowing what we need to do to eliminate it and just having to bite the bullet and do it. Some people think that those with hypertension are tense, nervous or hyperactive, but hypertension has nothing to do with personality traits. The truth is, you can be a calm, relaxed person and still have HBP..
*If your blood pressure reading is higher than normal, your doctor SHOULD take several readings over time and /or have you monitor your blood pressure at home before diagnosing you with high blood pressure. To get the most accurate reading at your next blood pressure screening, insist the procedure be done properly. Follow these tips given to us courtesy of Dr. David Williams. Rest at least five minutes beforehand. You should feel comfortable and relaxed in your surroundings. Have your reading taken in the morning because biological rhythms naturally cause pressures to be higher in the afternoons and evenings. Remove all clothing from the waist up. Just rolling up your shirtsleeve can act like a tourniquet and cause false readings. Ask that your blood pressure include readings taken while you are lying, sitting, and standing. Readings often skyrocket as you change positions, which may signal weak adrenal glands—not high blood pressure. Make sure your elbow is at the same level as your heart. Every doctor and nurse is taught this, but very few check it. An elbow that is even a couple of inches below the heart can make the reading as much as 17 points higher than it should be. There’s no telling how many people have “low elbow” instead of high blood pressure! Have your blood pressure taken three times with at least a one-minute rest between each one. A single high reading does not necessarily mean that you have high blood pressure. However, if readings stay at 140/90 mm Hg or above (systolic 140 or above OR diastolic 90 or above) over time, your doctor will likely want you to begin a treatment program. Such a program almost always includes lifestyle changes and often prescription medication for those with readings of 140/90 or higher. Problem with prescription meds is they are not getting to the root cause of the problem because the root cause has not been determined. 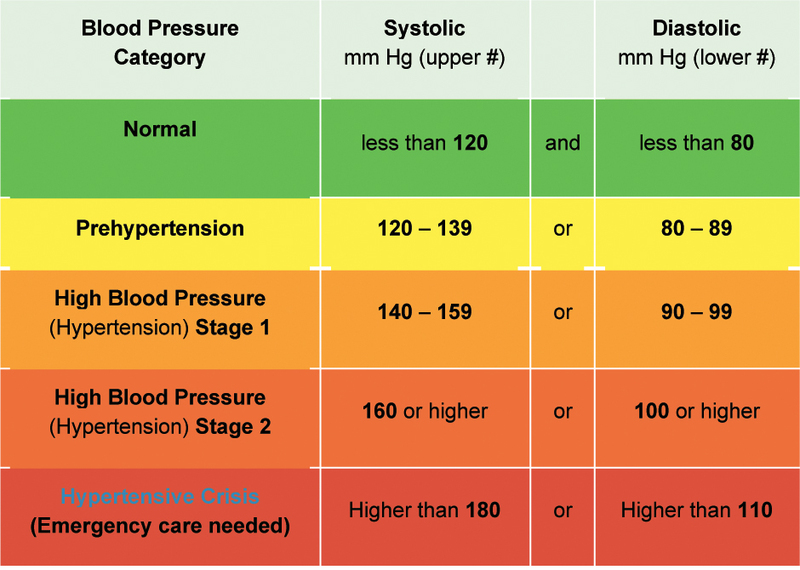 Which number is more important top (systolic) or bottom (diastolic)? The second # Diastolic is when the heart returns to rest in between heartbeats. 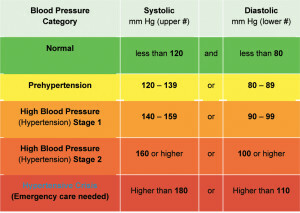 ** In most people, systolic blood pressure rises steadily with age due to increasing stiffness of large arteries, long-term build-up of plaque, and increased incidence of cardiac and vascular disease. It may be “normal” for older folks to have slightly higher pressure. At 60 years old, the circulatory system could never be the same as that of a 20 year old. *Alcohol consumption is a double-edged sword. Some studies indicate it helps lower blood pressure, while others report the opposite. In very small amounts it may lower blood pressure. But if you drink too much, even moderate amounts regularly, blood pressure levels may go up. People who drink more than moderate amounts of alcohol regularly virtually always experience elevated blood pressure levels.